Over 5,000 years ago a natural system of healing from within was created by the Vedic culture in India. 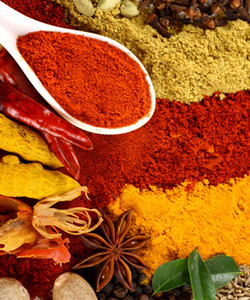 There are roots of this natural, healing medicine in Tibetan and Chinese medicines as well. After many years of being suppressed, the Ayurveda lifestyle has once again found its way into modern-day cultures around the world. According to Deepok Chopra, “recognizing that human beings are part of nature, Ayurveda describes three fundamental energies that govern our inner and outer environments: movement, transformation, and structure." These three energies are known in Sanskrit as "Vata (Wind), Pitta (Fire), and Kapha (Earth). Chopra explains that they shape and influence our individual nature and characteristics, "if Vata is dominant in our system, we tend to be thin, light, enthusiastic, energetic, and changeable. If Pitta predominates in our nature, we tend to be intense, intelligent, and goal-oriented and we have a strong appetite for life. When Kapha prevails, we tend to be easy-going, methodical, and nurturing." These three forces are present in everyone, but there are typically two predominant energies in each of us. In order for your hair to benefit from Ayurvedic treatments, your body must be treated just as kindly. A wholesome mix of natural foods, water and nutrients , as well as quality sleep and physical activity, will benefit you internally, and externally. When your diet becomes a healthier, more wholesome, one, your skin and hair will begin to reap the benefits as well. 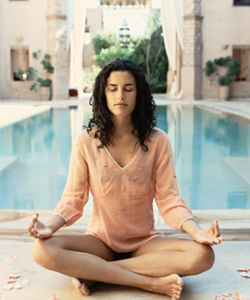 Here are a few ideas and tips to include in your healthy ayurvedic habits for your hair. Blend together all ingredients. If you choose honey, add it after pouring strained cheese into a glass, and stir it in with a spoon—heat created during blending can destroy the healing qualities of honey. Mix the ingredients together thoroughly and apply to dry hair for 30 minutes, and/or, up to 4 hours. Wash off in the shower and shampoo as usual. Do this regularly- once or twice a week- to experience amazing hair protective results.